The corrupted area is being heavily affected. A day after moving away from the rune near Pleasant Park, the floating island has selected its next target on the Fortnite: Battle Royale map. The island has now activated the rune between Shifty Shafts and Greasy Grove, marking the second rune it has reached. Just like the first rune, Loot Lake island stopped moving once it reached the corrupted area west of Shifty Shafts, and then it changed the entire landscape of the area. 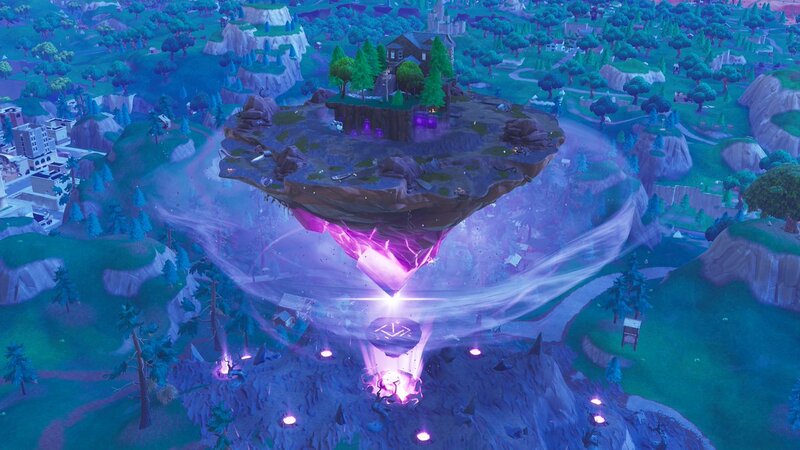 The Floating Island has just arrived at the second rune! The darkness has now started to spread on top of the island as well! Not only did volcanic pits sprout up from the ground, the rune symbol began floating above the ground as well. The “darkness,” which resembles the cube but in a more solid form, has also begun to spread more rapidly on the island, too. In the beginning, the darkness seemed to be contained to the underground, but it now has expanded vertically into the house that sits atop the floating island. If the pattern stays true from the first rune experience, the island will focus on the Shifty Shafts corrupted area for about two days before moving on to the next rune. Which rune that is remains to be seen since the island did not go in reverse rune order like some predicted. If the island would have done that, it would’ve traveled to Lazy Links today instead of Shifty Shafts. The closest corrupted areas to its current location are the first and third runes. Northwest of Fatal Fields sits the very first rune, which you would think would be of importance to the cube. The third rune is northwest of Salty Springs.